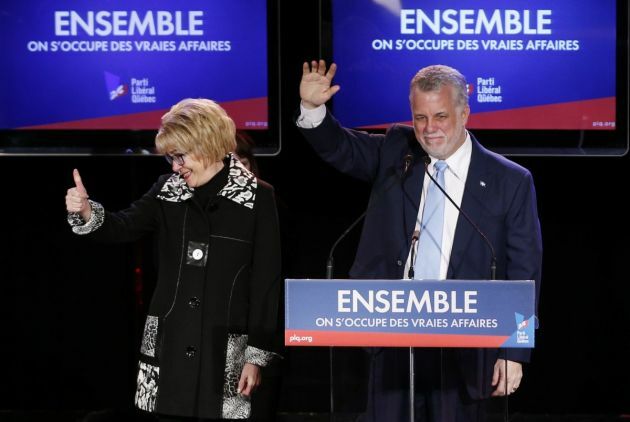 (Photo: REUTERS / Mathieu Belanger)Quebec Liberal leader Philippe Couillard takes the stage with his wife Suzanne Pilote at his rally headquarters in St. Felicien, Quebec, April 7, 2014. The Quebec Liberals won a majority government the Quebec provincial election. OTTAWA (Reuters) - The anti-separatist Quebec Liberal Party won a majority government in provincial elections on Monday, eliminating the possibility of a new referendum on independence from Canada for several years and crushing the separatist Parti Quebecois.